2. A Beautiful Mind : A Biography of John Forbes Nash, Jr. In this dramatic and moving biography, Sylvia Nasar re-creates the life of a mathematical genius whose brilliant career was cut short by schizophrenia and who, after three decades of devastating mental illness, miraculously recovered and was honored with a Nobel Prize. A Beautiful Mind traces the meteoric rise of John Forbes Nash, Jr., from his lonely childhood in West Virginia to his student years at Princeton, where he encountered Albert Einstein, John von Neumann, and a host of other mathematical luminaries. At twenty-one, the handsome, ambitious, eccentric graduate student invented what would become the most influential theory of rational human behavior in modern social science. Nash's contribution to game theory would ultimately revolutionize the field of economics. As a young professor at MIT, still in his twenties, Nash dazzled the mathematical world by solving a series of deep problems deemed "impossible" by other mathematicians. As unconventional in his private life as in his mathematics, Nash fathered a child with a woman he did not marry. At the height of the McCarthy era, he was expelled as a security risk from the supersecret RAND Corporation -- the Cold War think tank where he was a consultant. At thirty, Nash was poised to take his dreamed-of place in the pantheon of history's greatest mathematicians. His associates included the most renowned mathematicians and economists of the era: Norbert Wiener, John Milnor, Alexandre Grothendieck, Kenneth Arrow, Robert Solow, and Paul Samuelson. He married an exotic and beautiful MIT physics student, Alicia Larde. They had a son. Then Nash suffered a catastrophic mental breakdown. Nasar details Nash's harrowing descent into insanity -- his bizarre delusions that he was the Prince of Peace; his resignation from MIT, flight to Europe, and attempt to renounce his American citizenship; his repeated hospitalizations, from the storied McLean, where he came to know the poet Robert Lowell, to the crowded wards of a state hospital; his "enforced interludes of rationality" during which he was able to return briefly to mathematical research. Nash and his wife were divorced in 1963, but Alicia Nash continued to care for him and for their mathematically gifted son, who was diagnosed with schizophrenia as a teenager. Saved from homelessness by his loyal ex-wife and protected by a handful of mathematical friends, Nash lived quietly in Princeton for many years, a dreamy, ghostlike figure who scrawled numerological messages on blackboards, all but forgotten by the outside world. His early achievements, however, fired the imagination of a new generation of scholars. At age sixty-six, twin miracles -- a spontaneous remission of his illness and the sudden decision of the Nobel Prize committee to honor his contributions to game theory -- restored the world to him. Nasar recounts the bitter behind-the-scenes battle in Stockholm over whether to grant the ultimate honor in science to a man thought to be "mad." She describes Nash's current ambition to pursue new mathematical breakthroughs and his efforts to be a loving father to his adult sons. Stories of famously eccentric Princetonians abound--such asthat of chemist Hubert Alyea, the model for The Absent-MindedProfessor, or Ralph Nader, said to have had his own key to thelibrary as an undergraduate. Or the "Phantom of Fine Hall,"a figure many students had seen shuffling around the corridors of themath and physics building wearing purple sneakers and writingnumerology treatises on the blackboards. The Phantom was John Nash,one of the most brilliant mathematicians of his generation, who hadspiraled into schizophrenia in the 1950s. His most important work hadbeen in game theory, which by the 1980s was underpinning a large partof economics. When the Nobel Prize committee began debating a prizefor game theory, Nash's name inevitably came up--only to be dismissed,since the prize clearly could not go to a madman. But in 1994 Nash, inremission from schizophrenia, shared the Nobel Prize in economics forwork done some 45 years previously. boy, does he look a lot like russell crowe! It's amazing how much the picture of John Nash on the cover of this excellent biography looks like Russell Crowe! Or is it Russell Crowe who has the beautiful mind? How can someone with a beautiful mind throw a phone at a hotel receptionist? All kidding aside, this is an enjoyable read. The subject is well known to moviegoers, so they'll be quick to spot the mistakes in this book where it makes up incidents not found in the movie and shamelessly distorts other incidents found in the movie just to make a better-reading book. But that typically happens whenever a writer decides to write a book based on a movie. All journalistic integrity is forgotten in the interests of commercial appeal. To recapitulate, John Nash was a brilliant mathematician and a sometime a**hole who after publishing some breakthrough papers lost his mind intermittently for several decades, finally finding it again and re-emerging reasonably sane shortly after winning a belated Nobel Prize in Economics for his first big discovery in game theory. This raises interesting questions about the nature of paranoid schizophrenia and its interaction with brilliance. It's fun to speculate about this topic, especially because there are really no hard facts or proven theories so anybody's opinion is about as good as anyone else's. Certainly the author had fun speculating. For those readers who wish to learn more about Nash's mathematical discoveries there is the "Essential John Nash", which I challenge anyone without a strong background in math to understand any of. 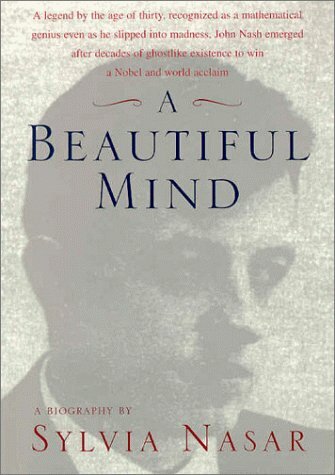 This book is an interesting and well-written account of a highly intelligent and creative man who suffered from schizophrenia. Like many people, I first heard of Nash by watching the movie starring Russell Crowe. The movie is true to the basic outline of the biography, but omits or fudges many relevant details. For example, the movie didn't mention Nash's travels to Europe or his divorce. From the movie, one would think that Nash's disorder began at graduate school at Princeton, since that is when he first "sees" his imaginary roommate. This imaginary roommate isn't mentioned in the book. Although eccentric and strange, Nash didn't suffer his first breakdown until age 30, which is relatively late for schizophrenia. If Nash had developed this disorder when he was 20, no one would have heard of him, and there would be no biography to read. It's important to emphasize this point. For every famous person like Nash, there are thousands of talented people who, due to mental illness, never get a chance to exercise their talents. What precipitated Nash's initial breakdown? It could have been his marriage that occurred two years before, along with his wife's pregnancy. Stress is known to precipitate psychiatric symptoms, and major life changes like getting married and having a child are significant sources of stress. It could have been a European honeymoon trip that Nash and his wife went on about 6 months prior to his breakdown. There's no way to know for sure. After his breakdown and initial hospitalization, Nash gave up his tenured position at MIT and headed to Europe, where he would spend the next 9 months, attempting to renounce his U.S. citizenship and become a "world citizen." This behavior exemplifies that the severe mental illnesses are primarily disorders of instability. Who in his right mind would give up a tenured faculty position at MIT? Most normal people crave stability, and there's nothing more stable than a tenured position. Mentally ill people crave the opposite; for them the stability of a tenured position is both frightening and undesirable. Nash's travels are further indications of instability. After Nash returned to the U.S., he had temporary episodes of sanity alternating with psychotic episodes. With some brief exceptions, he wasn't able to resume his career until he had a remission in his fifties. This remission occurred after having lived a relatively quiet and stable life at Princeton for over ten years. Nash won the Nobel Prize in economics in 1994. Nasar's biography convinces me that schizophrenia is closer to bipolar disorder than Alzheimer's Disease. Schizophrenia is an episodic disease, characterized by alternating sanity and insanity, of rational thought and delusions. At least in Nash's case, it doesn't appear to be degenerative. I recommend this book for anyone interested in the biographical details of an eminent man's battle with mental illness. This is the book that inspired the film of the same name staring Russell Crow. Whilst elements of the story are similar, anyone coming to the book from the film, as I did, will find a more complex, interesting, and, on occasions, unlikeable Nash than the Hollywood version. Starting with his early, pre-illness, days, Nash begins as a typically brilliant, temperamental, and eccentric genius. He knew it too with his interpersonal skills making him aloof and arrogant. Although it might have been wonderful to meet the early Nash, it is hard to see how one would have liked him. It seems astonishing, therefore, that anyone would feel romantically attracted to Nash, much less devote their life to his care, but this is exactly what Alicia Nash took on. The terrible effects of paranoid schizophrenia are evident in Nash's decline into alternative realities, which threatened to end his life as much as his career. It is a terrible illness. That Nash was able to recover is perhaps testament to his determination to restart his career as well as the unfailing love of his wife. For me, the title of the book could easily belong to Alicia. Nasar writes wonderfully well and she conveys the complexity of Nash's thoughts and his decline into illness in extraordinary detail. Occasionally, as with all good biographies, you feel that the characters let you down and Nasar never shies away from telling the whole truth. Whilst her voice is silent through most of the book it is only at the end, when the prejudice against mental illness comes to the fore, that Nasar allows her own distaste of such bias to surface. It forms a fitting conclusion to this monumental work. I bought this book after watched the movie based on the same book. I like movies based on academic settings. The book arrived on time and in good shape. In this essay smuggled out of Russia a renowned Soviet mathematician speaks out against the policies of the Steklov In­stitute in Moscow, which controls much of mathematical life in the Soviet Union. They control VAK, the certification commission that has the final say in ap­proving doctoral dissertations, and as Dr. Freiman documents, seem to be pursuing a policy that will make all of Russian higher mathematics Judenfrei. Freiman’s essay against the corruption of the minds and souls of men was prompted by his own student (identified only as B. in the essay) falling victim to this depraved system. Kafkaesque and Orwellian, the selection process Freiman describes is made possible by a blend of pathological anti-Semitism on the part of key individuals in the Institute and the unique Soviet system of rewards and punishments. The insidious process has proven effective to a remarkable degree. The Soviet Academy of Sciences contains only a single Jewish mathematician and the Steklovka is now Judenfrei. Written in the late 1970s, this disturbing essay on Russian anti-Semitism provides - in hindsight - a clear example of one of the many corrupting, self-destructive forces that operated within the Soviet bureaucracy and contributed to the eventual collapse of the Soviet empire. The author, Grigori Freiman, was a noted mathematician, a professor, and a member of the Communist Party. His samizdat essay was a plea for fairness and justice in the selection of Jewish candidates for advance training in mathematics. He also warned that Russian anti-Semitism was undermining the future of mathematics in the Soviet Union. Samizdat refers to the self-publishing of underground literature in Russia under Communism. A copy of Grigori Freiman's samizdat essay reached the United States in 1978. Southern Illinois University Press in 1980 published this small book, It Seems I Am a Jew, in cooperation with the Committee of Concerned Scientists. Melvyn Nathanson prepared the introduction as well as translated Freiman's essay into English. It Seems I Am A Jew is less than 100 pages (even including the forward, introduction, and a three part appendix). The essay itself is riveting, and most readers will likely read this disturbing essay in a single sitting. I highly recommend Freiman's remarkable essay to a wide audience that includes essentially any reader interested in history, concerned with the current political situation in Russia, or concerned with injustice wherever it occurs. The appendix will appeal more to readers that have an interest in mathematics. Extremely difficult test questions were reserved for Jewish students (and sometimes for testing non-Russians from the more distant Soviet republics).These questions were designed to ensure that all Jewish candidates failed, even Jewish winners of the Soviet Union's Mathematics Olympiad.By the late 1970s the mathematics section of the Soviet Academy of Sciences had nearly achieved the goal of Judenfrei mathematics. James Newman was a brilliant mathematician, the man who introduced the mathematical concept “googol” and “googolplex” (aka “google” and “googleplex”) to the world, and a friend of Einstein’s. He was also a notorious philanderer with an insatiable appetite for women and fast cars, a man who challenged intellectual and emotional limits, and a man of excess who oftentimes fell victim to his own anxiety. Jenniemae Harrington was an uneducated, illiterate African American maid from Alabama who began working for the Newman family in 1948—and who, despite her devout Christianity, played the illegal, underground lottery called “policy,” which she won with astonishing frequency. Though highly implausible, these two dissimilar individuals developed a deep and loyal friendship, largely because of their common love of numbers and their quick wits. Theirs was a friendship that endured even during an era when segregation still prevailed. For James, Jenniemae provided a particular ease and shared sense of irreverent humor that he found difficult to duplicate with his beautiful, intelligent, and artistic wife, Ruth. And when the Newman home was darkened by the tensions of the political climate during the Cold War, or by James’s affairs, or by Ruth’s bouts of depression, it was Jenniemae who maintained the point of gravity, caring for the family’s children when their parents were often lost in their own worlds. From Jenniemae’s perspective, James offered more than just a steady income. He became an unlikely and loyal friend. He taught her to read, and he drove her to and from his upscale suburban house and her home in the impoverished section of Washington, D.C. (and sometimes, much to her chagrin, in his Rolls-Royce), after she had been raped by a white bus driver. Intrigued by her uncanny wins at the lottery, James even installed a second telephone line in the house so that Jenniemae could keep track of her bets—a decision that raised a few eyebrows at the time. It is this extraordinary relationship that the Newmans’ daughter, Brooke, reveals in Jenniemae & James, as she elegantly weaves together the story of two very distinct and different people who each had a significant impact on her upbringing. In doing so, she also paints a vivid political and cultural picture of the time—when the world was terrified by the possibility of nuclear war; when America was reeling from the McCarthy hearings; when technological advances like televisions, satellites, and interstate highways were changing the country; when America was just beginning to venture into Vietnam; and when African Americans were still considered second-class citizens with limited rights, before the explosion of racial tensions in the early 1960s. 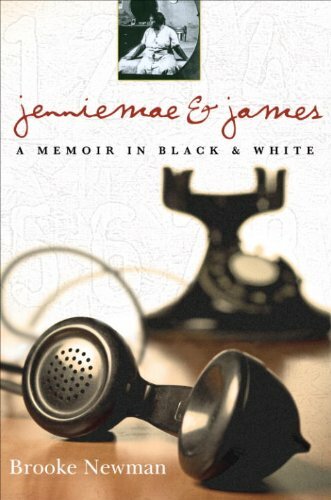 Jenniemae & James is an inspiring, heartwarming memoir about friendship and love across the racial barrier. There's nothing to complain about this book. It's just that I can't get too excited about any of it. I can't imagine having another person feel so indebted to my family that she would return to work the very day after giving birth. Mr. or Mrs. Bossman should have put her in the car and driven her right back home. That's practically voluntary slavery, such a feeling of indebtedness and/or responsibility to an employer. No one should have to work to raise another person's family and care for their home twelve hours a day, and I wouldn't feel comfortable bragging about it now. I find it insulting that Brooke dearest seems to be impressed and surprised that Jenniemae was commonly intelligent in spite of having no formal education. On second thought, I guess there is a lot to complain about in this book. The book is written pleasantly enough, but I just downgraded it by two stars. Jenniemae is a little too magical. Brooke Newman's childhood is undoubtedly a rich subject, but the author only hints at it's depths. A successful, largely self made bisexual mother, a renowned father with a weakness for women and a friendship with Einstein, and an invisible sibling combine for quite a wealth of source material. By narrowing her focus to her father's relationship with the housekeeper Newman is trying to live up to her subtitle of "A Memoir In Black & White". While I believe the love and the relationships are very real (my aunt is of a similar age and speaks of her own childhood housekeeper often) the story is white. Jenniemae never steps out from behind the apron unless it is in a point of crisis that James can help resolve. I don't want to in any way disparage the love that Newman obviously felt for the Jenniemae, but as a reader I am frustrated by a lack of information. The story of James & Jenniemae is told through romantic and imagined vignettes, conversations in private to illustrate points in the narrative. It doesn't feel real. As a reader, I want to seek out Jenniemae's family and find out what they thought of the situation, what their views on various events were. Did Jenniemae's daughter agree to the content of the book? Does Jenniemae's family view the relationship as something deeper than long time employer and employee? Ultimately, Jenniemae lived in service to James. He treated her well, he respected her, his daughter loved her, his wife comes to value her - but who is Jenniemae when the image of employee is removed? How does her daughter remember James? Also invisible is the author's brother, who may have asked to be excluded from the work, the author doesn't say. Jenniemae and James is more the author's interpretation of the relationship between her father and his housekeeper than a true biography of the two people. It lacks nuance or depth, but it has a good heart. You feel that Newman wants you to understand how important these people were to her and, in her opinion, to each other. She urges the reader to remember them kindly through her narrative, but it is too deeply rooted in convention to bring Jenniemae into focus. I would suggest this as an excellent book for readers younger than the author, who may not have a family history that includes a figure like Jenniemae. It is an excellent portrait of how the family viewed the help, the way they saw the relationship, and it would be an excellent counterpoint to a similar book from the other point of view. My aunt could have written large parts of this tale, about her own father and his employee. Fictionalized as the conversations must necessarily be, the emotion of them rings true for a child's experience. I am a frequent reader of memoirs and consider myself a good judge of which ones are exceptional - and this memoir by Brooke Newman about her father and their African American housekeeper is unquestionably one of the best written and most interesting memoirs I have yet read.The story is fascinating. The interweaving of the social and political history is wonderful, and grounds the reader in time and place. The dialogue is pitch perfect and the characters come to life as each scene is presented.This book is a must read for anyone who enjoys a well written book that is based on historical events. This book is a touching story about two completely different people who have a common love of numbers.The story is beautifully written and takes twists and turns that keeps you turning the pages.I started and finished the book within 24 hours because I could not put it down.By the end of the story I was emotionally involved and felt for both Jenniemae and James.A truly enjoyable read that I will be recommending to all of my friends. Brooke Newman gives us a close-up picture of the less-than-perfectly-functional family she grew up in.I can't call it dysfunctional, because as nearly as I can make out, Brooke, at least, has turned out ok.Her parents, James and Ruth Newman, were respectively a brilliant and successful mathematician not unduly influenced by societal norms and a not-so-successful would-be poetess with a day job as a remedial reading teacher.As parents, they were loving but tended to be, as Brooke put it, preoccupied. (1)He had a phone installed in Jenniemae's room, for her use in playing the numbers.The phone installer clearly disapproved of providing a phone for a black servant; such a thing just wasn't done!But James insisted. (2)When he learned that the driver of the city bus Jenniemae rode home from work had raped her, he insisted on driving her to and from work each day thereafter.When he found out that her daughter had been badly scalded,he insisted on taking the baby to the hospital, at his expense, which almost certainly saved Lilac Belle's life. (3)When he gave the commencement address at Johns Hopkins in 1965, he invited his family including Jenniemae.She was one of the very few blacks (probably the only one) in the audience. Brooke has shown her family members (except her brother Jeff, whom she barely mentions) to be admirable in many ways despite their faults.For me, at least, James Newman is now a real person instead of just a famous name. 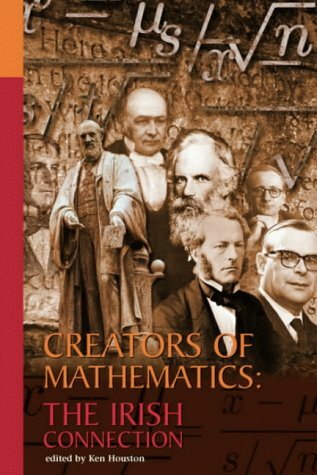 This book is a valuable resource for people, inclucing students, who want to know more about the people who created the math we know.Interesting reading. 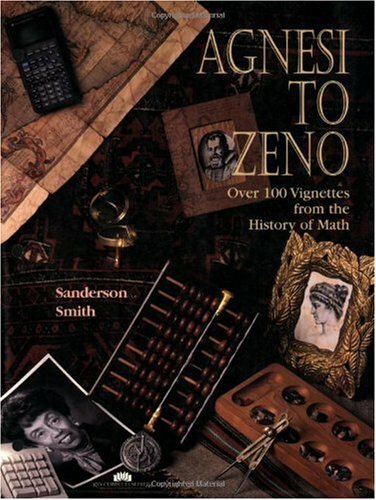 Wonderful book of Math History!! This is a great book to use in the classroom and provides great information on the history of math concepts.I use it in my middle school classes and the kids love it! Fantastic resource for all math teachers. At the time her nine-year-old son was diagnosed with a brain tumor, Joan Richards was deeply involved in writing a book about the life and work of the nineteenth-century mathematician Augustus De Morgan.Immersed in this abstract, logical world of science, Richards was forced by her son's sudden illness to confront a different kind of reality--the irrational world of a serious family illness and its consequences. An intellectual memoir, Angles of Reflection portrays a woman deeply enmeshed in two male-dominated worlds--nineteenth century mathematics and twentieth century research academics--struggling to integrate the competing demands of family and career without sacrificing one to the other.As the strain of caring for her sick child mounts, Richards' view of De Morgan broadens to include his family in ways that both illuminate his work and force her to reevaluate her own career and relationships.In the process, she gives new meaning to the term "applied mathematics" by drawing life lessons out of De Morgan's logic, Newton's absolute space and time, and Leibnitz's relative visions of reality.She emerges from her ordeal profoundly altered, with a new appreciation of the ways that life, family, and work can inform and enrich one another. 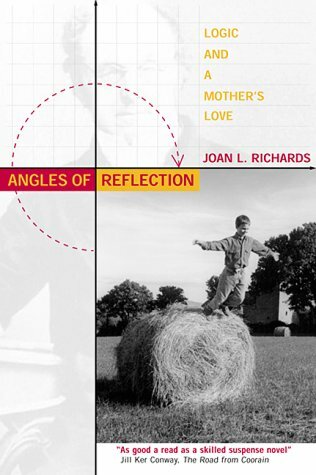 I just spent the past Saturday afternoon reading _Angles of Reflection_ by Joan L. Richards and was quite moved by it.For anyone who has had to grapple with balancing work and family -- including in academics where one's schedule is flexible but at times consuming and unpredictable -- this book is a must read along with other similar volumes, such as _Divided Lives_ and _True North_. Richards's depictions of "mother's time" and "professional time", as well as the conflict between the two, could very well have been a chapter in Alan Lightman's _Einstein's Dreams_.German culture is not a very hospitable environment for working mothers, but Richards navigates skillfully through maternal care, professional meetings, and daily annoyances like sharply abbreviated hours for grocery shopping. Her depiction of the German medical system, a form of socialized medicine, might be looked upon as idiosyncratic and Byzantine by all except those of us who have to deal with American HMO's on a regular basis.Past and present, as well as life and art, overlap in this deliciously engrossing volume: as she cares for her son, Richards works through the intricacies of her biographies of Augustus and Sophia De Morgan and finds in their child, Alice, a parallel story of parental concern.Richards's story reminded me of a statement attributed to Jackie Kennedy Onassis: when asked about raising her children, she is supposed to have said, "If I fail at this, nothing else matters. "Above all else, Richards's love and care for her two boys shine through this volume, even on pages dense with Newton, the De Morgans, and probability theory.This book, written in the tradition of Jill Ker Conway, is required reading for anyone, but especially for those curious about how the thinking lives of academics intersects with the practical and emotional lives of the everyday world.Highly recommended. I found this book to be very well written, and at the beginning I had high hopes that I would like it very much.However, I found that as the book went on, I was less and less sure what point the author was trying to make and just what the focus of the book was supposed to be.What the author's son Ned went through with two unrelated and severe medical problems was compelling to read about, but not really enough to carry the book.The math history parts of the book often seemed quite unrelated to the main tale.Perhaps the book was a way to expose the many uncaring or distant medical professionals the author encountered, but this was not tied together into a real message.Or perhaps the author was telling her story to justify her decision not to return to the States with her son once he ran into medical troubles in Germany---which in my eyes didn't really need justifying---I would not see Germany as having less competant medical care than the US.In any case, I found the ending a bit unfinished---I didn't really see how all of a sudden Ned's elbow was fixed, and we were not told much about the final outcome of his seizures or his brain surgery, although the book was published at least 3 years after these problems started.I feel there could have been a much better book here with more focus and more of a unified point.However, I did finish the book and am still thinking about it--a sign of something worth reading. I have read this book twice, and recommended it to several friends, and find it a most complex and multi-faceted tale. On the one hand a poignant account of a sick child,and an examination of the difficult decisions everyone has to make under uncertainty, it is much more than that as it weaves Newton, Leibniz and Augustus de Morgan and the choices they made into the story. It was in many ways a brave decision of Joan Richards to write and publish this book, and those who read it can judge for themselves her success--I found it riveting, and even better on the second reading.